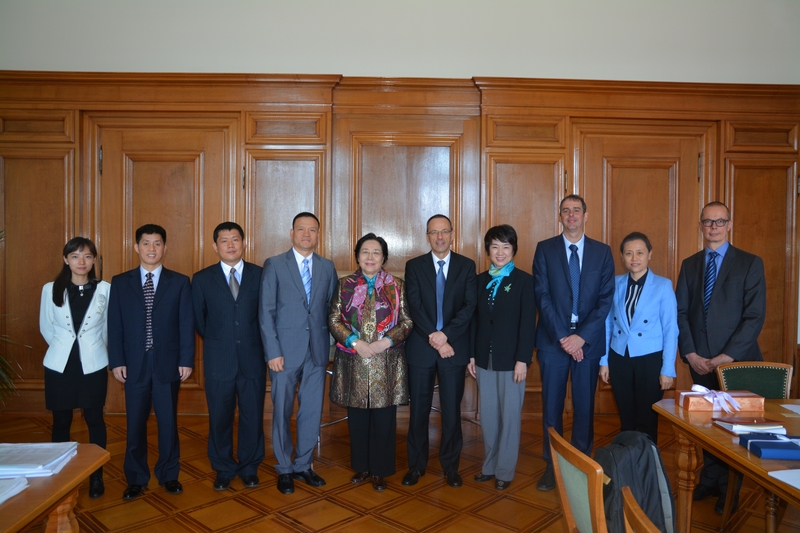 On August 25th, 2015, the Vice Chair of CPPCC Committee of Population, Resources and Environment, Co-chairperson of International Network for Bamboo and Rattan (INBAR), Director General of International Centre for Bamboo and Rattan (ICBR) Jiang Zehui headed a delegation to visit Switzerland ETH. The delegation conducted in-depth academic communication with wood material science experts in ETH’s Department of Civil, Environmental and Geomatic Engineering. Deputy Director Li Xiaohua representing ICBR signed “Cooperation Agreement between International Centre for Bamboo and Rattan and Switzerland ETH’s Department of Civil, Environmental and Geomatic Engineering” with the foreign party. Professor Ingo Burgert, the fellow of International Academy of Wood Science presented the latest achievements in in wood material science research. Doctor Mateusz Wielopolski introduced the bamboo fiber composite project conducted together with Singapore Advanced Fiber Composite Library. Professor Yu Yan, on behalf of ICBR, presented the academic report of “Bamboo Engineering Material and Fiber Mechanics Research of ICBR”. After the academic exchange, Chairman of ETH school board Prof. Lino Guzzella met the delegation. Prof. Jiang Zehui said that bamboo’s features of quick growth and high quality have been currently attracting scientists from various areas. Some European and North American universities and institutions have done a lot of high level research work in this area. We are delighted to see more and more of our peers from developed countries joining bamboo research. This will promote a better development and prospect for bamboo, a special plant which is neither grass nor wood. Lino Guzzella agrees with Director Jiang, indicating that he will fully support the cooperation between ETH and ICBR in bamboo and wood based recyclable construction material. Zhang Hongyan, deputy director-general of the Department of International Cooperation of China State Forestry Administration and Xu Qiangxin, division director of International Cooperation Project Center attended the meeting.